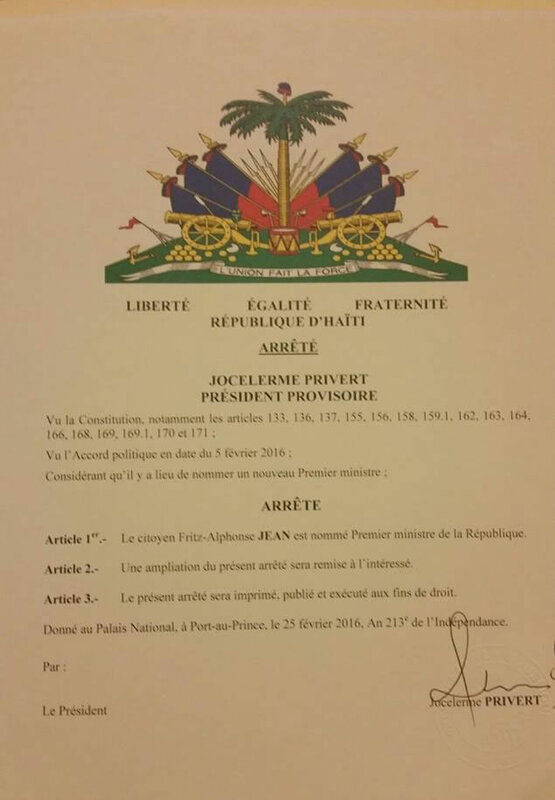 Here is a copy of the decree appointing economist Fritz Alphonse Jean as Prime Minister of Haiti. On February 26, 2016, Jocelerme Privert, the interim President of Haiti has appointed well known Haitian economist Fritz Alphonse Jean (59) as the new Prime Minister of the provisional government. When Privert announced the name of Fritz- Jean as the new Prime Minister, former Prime Minister Evans Paul could not hide his dissatisfaction. He has openly stated that the accord signed between Jocelerme Privert and former President Michel Martelly has entrusted Privert the responsibility to complete the remaining election process, the final run off between Jovenel Moise and Jude Celestin within the scheduled date on April 24, 2016 and install a new President on May 14, 2016. Since Privert was the principal architect of the agreement with his erstwhile capacity as the Senate Chief, he must strictly respect that agreement. The announcement of Fritz-Alphonse Jean as the new Prime Minister by the new provisional president is contempt of the Haitian constitution. Such announcement was made without any confidence vote, without the approval of the presidents of the both houses of the Parliament, and without the confirmation of the eligibility of Fritz-Alphonse Jean as the Prime Minister. Professor Fritz Alphonse Jean is a Cap-Haitien born U.S. educated economist, politician and writer who had served as the governor of the Banque de la République d'Haïti between 1996 and 2001. He studied economics and mathematics in the United States, in New York. Since 2012, he had served as the President of the Chamber of Commerce, Industry and Professions of the North East Department. In his acceptance speech, Jean has acknowledged that his task is huge. It is something more than organizing a fair election; he has to re-establish the macro- economic stability in the country. All Haitians must set aside their differences for the sake of the country to take it out of the present social and economic difficulties. After having multiple exchanges with various sections of the society for nearly two weeks, and having consultations with the President of the Chamber of Deputies, Cholzer Chancy, and Deputy Senate President, Ronald Larèche, the Provisional President Privert has chosen him as the new Prime Minister. Privet is of opinion that the appointment of Jean in no way contravenes the Haitian constitution. His appointment was made in accordance with the constitution in force and respecting the agreement of 6 February, 2016. The parliament, with supports from the both houses of the government, would confirm the eligibility of the consensus prime minister. Following the vote of confidence, the new Prime Minister will be installed to his functions.